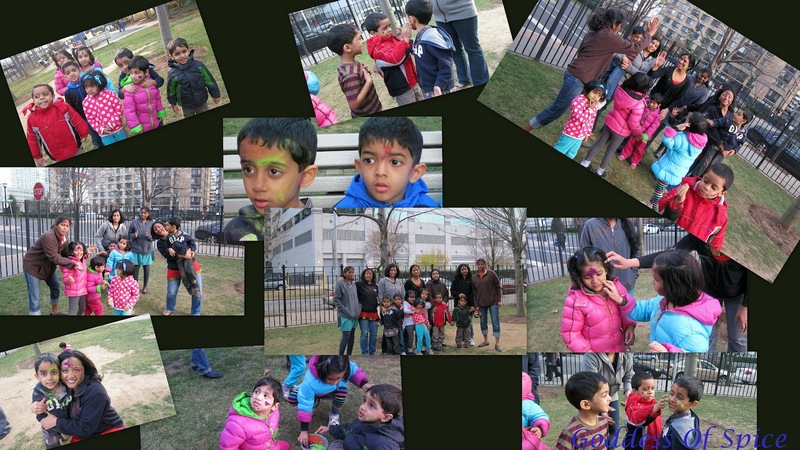 Today is Holi, or should I say yesterday was Holi! Two occasions that really make me miss home are Diwali & Holi! Whatever we do here, it is never going to be the same as celebrating in India. Having grown up in the Northern part of India, I have had ample opportunity to make the most of this colorful festival. The streets would be rent with loud music playing from every nook and corner, mostly "रंग बरसे", "होली के दिन" and "होली रे होली"! The first day is called "Choti Holi" and that night we would gather around a bonfire to depict the burning of "Holika". The legend is that the evil King Hiranyakashyapa ordered his sister Holika (who was immune to fire) to hold his son Prahlad on her lap and sit on a burning pyre. He wanted to kill his son because Prahlad prayed to God while his father declared himself as Supreme! But such was the devotion of Prahlad that he was untouched by the fire while Holika burnt to death! This is from "Narasimha Avatar" - one of the Dashavatars of Vishnu. The color play is said to have originated from another Vishnu avatar - Krishna! Krishna was dark while Radha was fair, so Krishna was jealous and complained to his mom Yashoda about the same. That is when Yashoda, to pacify a crying Krishna, said that he could apply color on Radha's fair face, she would become any color that he chose to apply on her! To this day, holi is celebrated with much fanfare in Mathura and Vrindavan, where Lord Krisha lived. I was never really fond of too much color play, but used to love drenching and getting drenched with colored water! It was so much fun to lie waiting, hiding in our balcony and pour bucket loads of water on unsuspecting passersby! Me and my sister would usually have a couple of friends over to join in the fun. The skill with which we would take turns filling water in balloons, tie them up and carry them with utmost care to throw at everyone could have put the best assembly line production system to shame! The pichkari (plastic or metallic water guns) wars were fought with all the seriousness of a real ware on the battle field! The whole house used to be a wet colorful mess - sorry amma, it's only now that I realize what a pain it is to clean! There would be a constant stream of visitors distributing sweets, the adults would put tika on each other and the more adventurous ones would apply color all over! After all, "होली है भाई होली है, बुरा न मअनो होली है!" The kids of course would sport so much color on themselves that it is a miracle we could make out who was who! I remember, the next day at school, there used to be a competition to see who got the most color on them! I really felt sorry that my kiddo had no idea about the festival. But this year, he came to know about it at his Balavihar class and he was intrigued. I thought, why not tell him all about it. 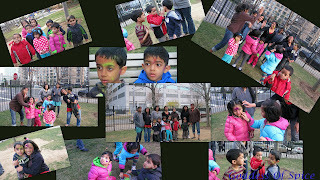 So, I gathered a few of his close friends and their moms from our neighborhood, and decided to tell them all about how and why we play holi. I couldn't arrange for a full fledged color & water play. The water because winters here are not conducive to getting wet, and color because it was too short a notice for me to obtain a permit to use colors in any of the open spaces. So, we just let the kids smear a little bit of color on each other. I told them about the stories behind the origin of this festival. And made ghujias! I also took the liberty of modifying the ingredients used typically and I used dumpling wrappers (found in the freezer section) instead of kneading and rolling out my own dough! Certainly made my life easier! Roast the poppy seeds and semolina separately and set them aside. Cook the mawa on a low flame for about 3-4 minutes, stirring constantly. Remove from flame and let it cool for a few minutes. 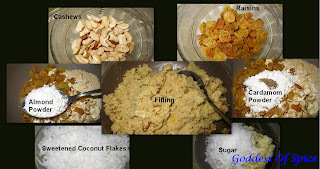 While it is still warm, add the remaining ingredients for the filling and mix thoroughly. Take a dumpling wrapper, add some filling to it and wet the edges. Now, fold it into half so as to form a semi-circle with the fillings sealed in it. The water helps to seal the edges firmly. Do the same for the remaining wrappers and keep them covered with a moist cloth/paper towel so that they don't dry out. Heat oil in a wok/pan and deep fry the ghujias on a medium flame, until they turn golden brown. Remove and drain them on an absorbent paper. In a separate utensil, boil the sugar and water for the syrup till they reach a one string consistency. Now dip the ghujias in it one by one and lay them out to dry. Scrumptious, crisp ghujias are ready. You could use fresh dough made with all purpose flour, ghee, semolina & water instead of the dumpling wrappers. Roll them out into puris and proceed from step 5. You could use a mould to shape the ghujias instead of making simple semi-circles. Or you could use a fork to make decorative indents on the edges. If you are using unsweetened coconut flakes or freshly grated coconut, you might want to increase the amount of sugar to compensate for the lack of sweetness in the coconut. Sending it across to Holi Fest at Sizzling Tastebuds.